Power and powerlessness are what I hear as the core elements underneath this week’s scriptures. How does leadership approach power? How about us when we have power, and when we don’t? It make seem beside the point, and yet this week we’ve heard of the drowning of hundreds of African immigrants off the shore of Italy, a powerful general judged for crime, the rumblings of those running for the presidency, and continued talk about gentrification, Jesus is talking to us in our today – calling us to be for and in the world as doors & good shepherds. Psalm 23 is in my experience as a pastor the scripture that has been asked for in every memorial service that I’ve officiated. Young, old, male, female, protestant, catholic: this scripture about God as a shepherd seems to speak to us, across our cultural difference, beyond our age experiences and through our specificities. Curiously few of us know a shepherd, or have experienced one like those that first heard this worship poem thousands of years ago. It was addressed to a people who had a huge influence of pastoral work, caring for creatures, in their economy, cultural language and religious experience. For us, when we most hear of shepherds it’s usually a breed of dog at the dog park. What are the metaphors in this worship poem that speak to you? What’s the overall message you receive from it? Our selection of John 10:11-18 is situated in a larger section about the good shepherd in John 10:1-21. Jesus speaks of himself as both a door (gate) and the good shepherd. A door is a fundamental symbol for us. It’s a passage from one place to another. Jesus is the door from heaven to Earth, from our interior lives to our exterior lives. From our “center” to the world. Jesus gives us thus access to the universe, to others, as well as to the truth of who and how we are ourselves. In him, as in Psalm 23, we will find salvation: the passage from where we are trapped, alone, broken and isolated to where we are one with Christ, whole, holy, and free to be for others. As a good, ideal or model shepherd, Jesus is unlike the bad shepherd who is paid to protect the sheep (they are also talked about by the prophet Ezekiel in Ezekiel 24:1-24; those who forsake the people of God out of self-interest). Jesus himself pays, with his life, to save us from the wolves and dangers outside of life. He gives his life not to save us from our sins as much as to proclaim that he is there for and with us. We are his people (Psalm 100) His love is unconditional. He lays down his life for those he knows intimately, by name, as well as those who don’t yet know him. His love is sacrificial, intimate, other-centered – the very essence of friendship. Jesus gives his life and takes it back. He dies and resurrects. He gives and has a balance in giving, not forgetting who he is. We then by extension to live as Christ lives for us, to love as he loves (John 15:13). We are to be doors for others, passageways not to our own goodness, but to the love we see and know in Christ. We are called to be good shepherds, loving enough to give our lives and to take them back; loving radically but not in a self-destructive way (see the parable in Matthew 25:31-46. What word grabs your attention in today’s selections? Why do so many people request Psalm 23rd be read at a memorial service? How does it speak to you? How have you experienced power and powerlessness in your life? In faith? 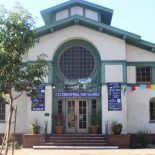 In your experience of the church? The art piece is one of the earliest known Christian artistic representations of Christ. 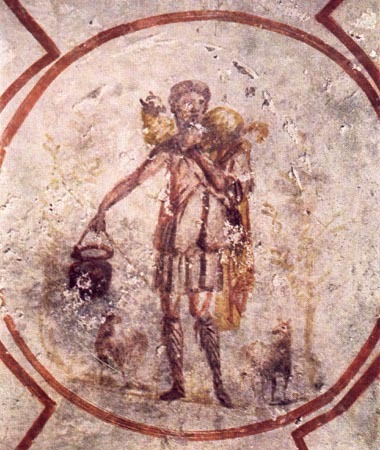 “Good Shepherd” from the Catacomb of Calixtus in Rome. I get the shepherd as Jesus, but the “hired hand” surprised me! Are we the sheep, or the hired hand? I so often feel like the hired hand, who falls asleep and fails to guard the sheep from the wolves. And, at some point in our lives, do we accept responsibility for being a shepherd to others, or do we always stay in our “original” role? This entry was posted on April 24, 2015 by capcoakland in Uncategorized.